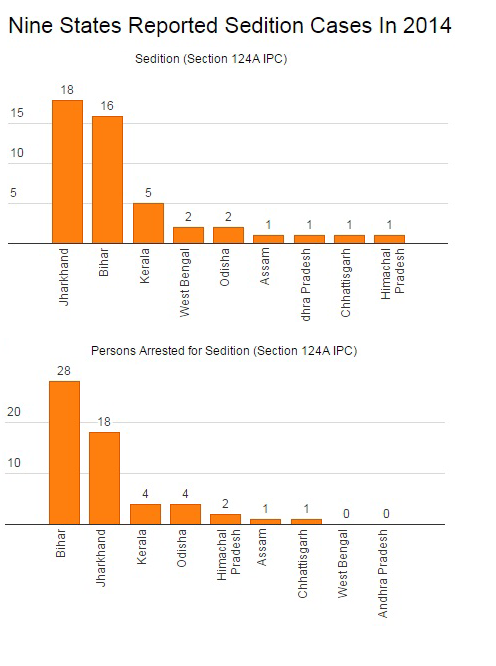 Which Indian state files the most sedition cases? 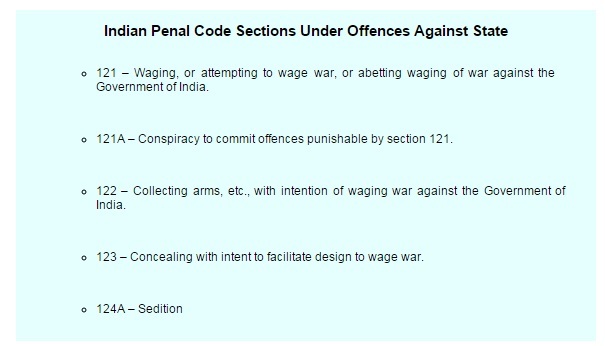 Section 124A of the Indian Penal Code was widely used by state governments in 2014. India’s 156-year-old, colonial era sedition law – used against arrested Jawaharlal Nehru University Students’ Union President Kanhaiya Kumar – has been discarded by the United Kingdom (where punishment once included chopping ears), Scotland, South Korea and Indonesia. Kumar was remanded to judicial custody for 14 days – amid violence within and outside a Delhi court room – after being booked for sedition under section 124A of the Indian Penal Code, which does not actually use the word “sedition”. As many as 47 sedition cases were reported in 2014 across nine Indian states, according to this National Crime Records Bureau report. “When a person is dubbed 'anti-Indian', it is distasteful to India’s citizenry, but then to be “anti-Indian” is not a criminal offence, and it is definitely not “sedition”. (It only means that you are a freak, and that it is high time to have your head examined! ),” Nariman wrote. Jharkhand reported the most cases (18), followed by Bihar (16), Kerala (5), Odisha (2) and West Bengal (2). 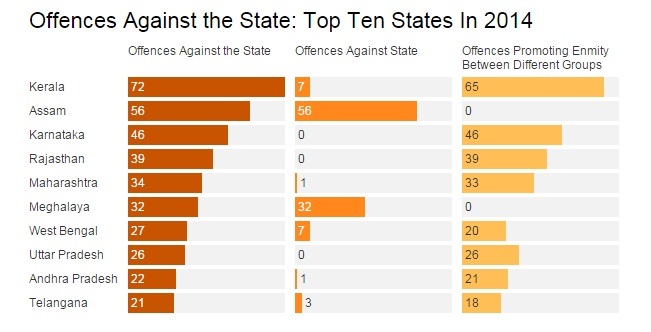 Jharkhand and Bihar accounted for 72% of the total sedition cases in 2014. Bihar topped with 28 arrests, followed by Jharkhand (18), Kerala (4), and Odisha (4). As many as 58 people – 55 men and three women – were arrested for sedition. The NCRB included data on Offences Against the State for the first time in 2014. Offences Against the State have been classified largely under two categories: Offences against state (under sections 121, 121A, 122, 123 & 124A IPC) and offences promoting enmity between different groups (under sections 153A & 153 B IPC). Offences against state are further classified into sedition (section 124A IPC) and others (under section 121, 121A, 122, 123 IPC). Others, with 129 cases, accounted for 73% of the total cases under Offences Against the State. In all, 512 offences against the state were reported in 2014, of which 176 were Offences Against the State and 336 were offences promoting enmity between different groups. About 872 people were arrested – 865 males and seven females – under these crimes. As many as 323 cases were reported under section 153A of the IPC for promoting enmity between different groups on ground of religion, race, place of birth, etc. 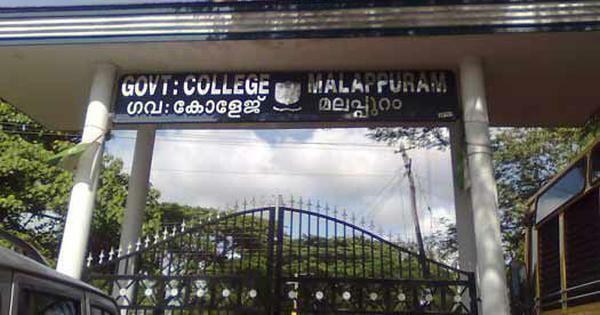 Kerala reported the most – 59. Maharashtra reported the most arrests – 204 – for Offences Against the State, followed by Kerala (98), Meghalaya (67), Karnataka (63), and West Bengal (59). These top five states account for 56% of the total arrests across India. In contrast, in October 2015, the Malaysian federal court dismissed a challenge to its colonial era sedition law – with the same origin as India’s – often used to quell political opposition. This article was first published on IndiaSpend, a data-driven and public-interest journalism non-profit.